Much Ado About Nothing is a cute and stylish modern adaptation of Shakespeare's play, but it's largely unremarkable especially when compared to film versions that are already out there. Geek icon Joss Whedon takes on The Bard in Much Ado About Nothing and creates a Shakespearean comedy/tragedy for the modern era. Fans of Whedon (Buffy the Vampire Slayer, The Avengers) may not appreciate his stylistic black and white updating of the classic play, but they will surely appreciate the use of a cast which includes Nathan Fillion and Sean Maher (Serenity, Firefly), Amy Acker and Alexis Denisof (Angel), and Clark Gregg (The Avengers). Whedon himself, after fording a number of questions at Austin’s indie film festival SXSW about why he decided to do Shakespeare, ended up saying that the answer should be clear once audiences saw his movie. I took that to mean, after watching the film, that Shakespeare’s genius is just as relevant today as it was hundreds of years ago. Whedon has set the Shakespearean play Much Ado About Nothing in modern times because Shakespeare’s perception of love, loss, jealousy and wit (and a whole slew of subtle human emotions/interactions) is truly timeless. And no one does witty banter like Shakespeare (Whedon’s own brand of quirky and clever dialogue aside). I thought this updating generally smart and well-executed, but I would question the use of the play Much Ado About Nothing versus other Shakespearean comedies to modernize. I also feel like there is a great version of Much Ado About Nothing already out there in Kenneth Branagh’s 1993 version. If that version had been anything less than it was, I might applaud another cinematic rendition of this play, but Branagh definitely knows Shakespeare and his movie version was excellent. Whedon, to his credit, keeps the original Shakespearean language. He only stages it with modern conceits, using his house for the setting and modern-day Americans for the characters. Since the play has characters and uses term like “prince” and “count,” among other turns of phrase that are difficult to translate to modern times, parts of the movie are awkwardly at odds. A staged death and elaborate funeral procession with glowing candles also seemed awkward and hard to accept against a backdrop of modern times. Not to mention the fact that Hero’s virtue (maidenhood) is so important that when she is thought to not have it, her father is ready to kill her with his bare hands; hardly modern day sentiments (though this is probably subjective). What works well though is the witty banter between the characters Benedick (Denisof) and Beatrice (Acker). Perhaps because they have worked together before on the TV series Angel, but Denisof and Acker have great chemistry and their scenes are some of the best in the movie. Here, at least, the Shakespearean dialogue fit perfectly and one hardly notices the use of high language. A barb in Shakespearean language is sometimes better than any comparable modern-day put down. The set up in Much Ado About Nothing is a basic comedy of errors with a little tragedy and drama thrown in. A wealthy family is visited by a very great man of circumstance and his retinue, who have just returned from the wars (in the case of Whedon’s version, it’s a very important politician who has just completed a hinted-at secret military mission). Benedick, a lord in the prince’s retinue, hates women and vows never to get married. Beatrice, a cousin to the daughter in the wealthy family, hates men. Naturally, a scheme is concocted to get the two to fall in love. Meanwhile, another noble in the prince’s retinue falls in love with Hero, the only daughter of the wealthy Leonato. Their love hits obstacles as the prince’s evil brother Don John tries to throw a wrench in their plans for marriage. Given the fact that this film was shot mainly at Whedon’s home, it is the performances and the wit of Shakespeare’s play that makes it work as well as it does. Besides Acker and Denisof, Fillion delivered a delightfully comedic Dogberry, the half-witted security guard. 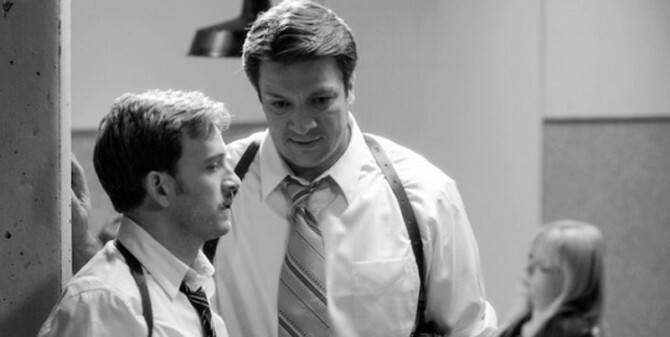 Tom Lenk (Buffy the Vampire Slayer) brings his geeky funny-man out to play as Dogberry’s second in command, and he and Fillion steal many a scene. One of the less compelling performances is from Fran Kranz (The Cabin in the Woods) as young Claudio, Hero’s love interest. His character is a tedious and whiney nobleman, and very hard to sympathize with. As he is one of the main characters, this effected my enjoyment of the film. Overall, Whedon has created a cute, modern (accentuated by the decision to film it in black and white) version of a great Shakespearean play, but it’s not outstanding. And since Branagh’s version is so excellent, Whedon’s Much Ado About Nothing feels unnecessary in the first place.